Yeah coz sharing this stupid picture on Facebook is going to change things isnt it? It seems that every time I go on Facebook these days I’m bombarded with Memes like this one. To me, if you are spreading nonsense like this around Facebook you are akin to the folk of Nazi Germany who enthusiastically delivered pamphlets to their friends and neighbours talking about the “vile poison” in society that was Judaism. Islamic Extremists are not the same as ordinary Muslims. We don’t judge Christians by the actions of the Westboro Baptist Church. Why would we? They are clearly insane. I must admit I don’t know loads of Muslim people but I’ve met enough who were decent, kind and generous to know that it’s incredibly infantile to judge an entire community by the actions of those appalling human beings of IS and other Islamic terrorist groups. I mean look at the above image and can you not see how infantile, inflammatory and divisive it is? Even if ALL Muslims were terrorists does it really help solve the problem by inciting hatred and animosity towards them? Who cares if you like Bacon? 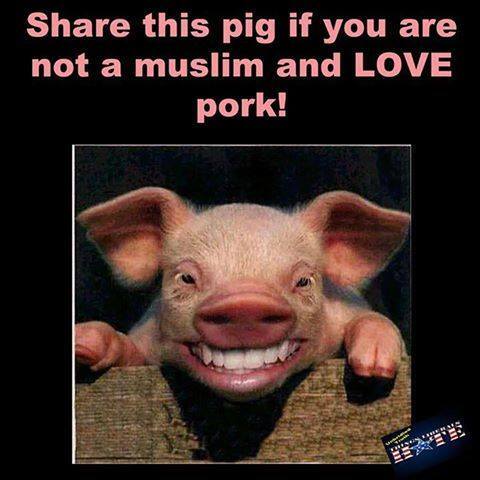 I don’t, and believe it or not most Muslims don’t either. Just be aware that however “Fun” or “Harmless” you think these Memes are, you are actually spreading the bigotry and propaganda of the far right. If you met some of the people who disseminate this information you would be horrified at how ignorant, crass and downright stupid and violent these people are. Somehow it doesn’t have a face when its on Facebook in the privacy of your own home, but some of us do not want a repeat of Nazi Germany. Our Grandparents died not to protect white people in little Britain from Muslims, Jews and Black people, but from the very people who spread images of Poppys on Facebook calling for a ban on the Burkha and telling us lies about the evils of that community. Grow up people. Racism is not cool and it’s never going to be. You just make yourself look like an idiot when you share stuff like this.